For this DIY I used the Dotti 'Snake Day' bag (which bares an uncanny resemblance to the Wang 'Trudy' tote) and silver cone studs purchased from studsandspikes.com. I'd recommend using a bag with a constructed base so the bottom won't fold up when being worn. 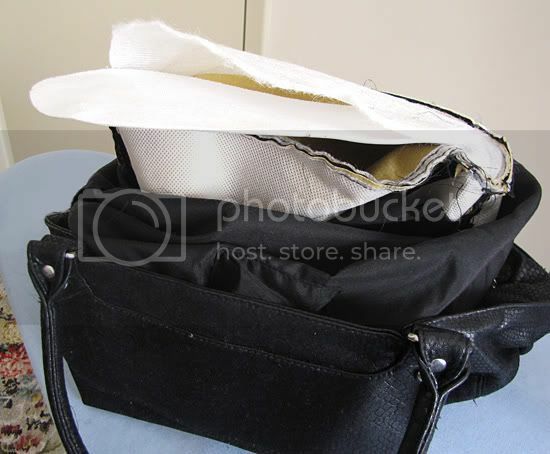 The bag I an using is lined and has a constructed, hard base, which needs to be removed before I can stud the bag. 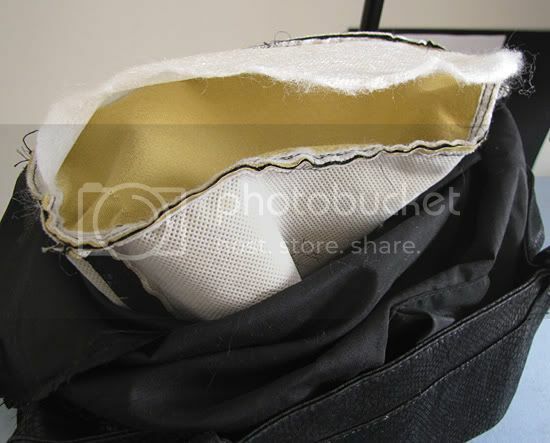 If your bag has a softer base or no lining you'll find it much easier! 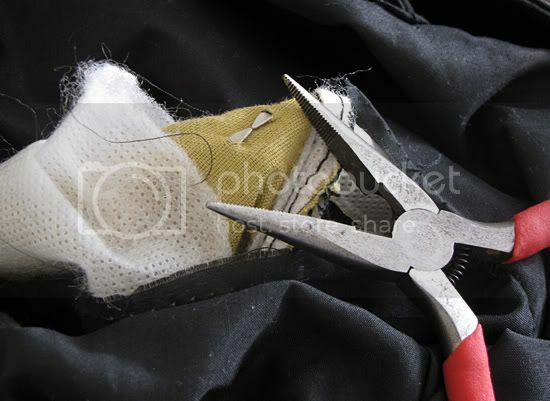 Tools needed include small scissors, pliers, needle & thread, cone studs and a sewing machine. 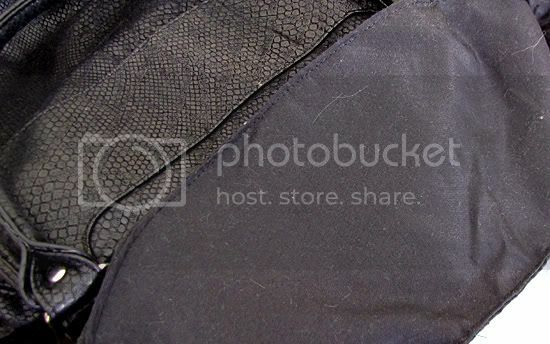 Pull the lining outside of the bag and unpicked the stitching 1/2 of the way around the base, leaving a big enough hole to comfortably work on the bottom of the bag. 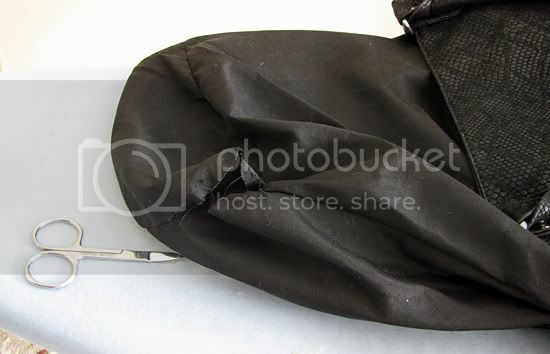 Turn the bag inside out and pull the base through the hole in the lining. Snip the inner most layer of the base 1/2 way around and remove the piece of cardboard base. 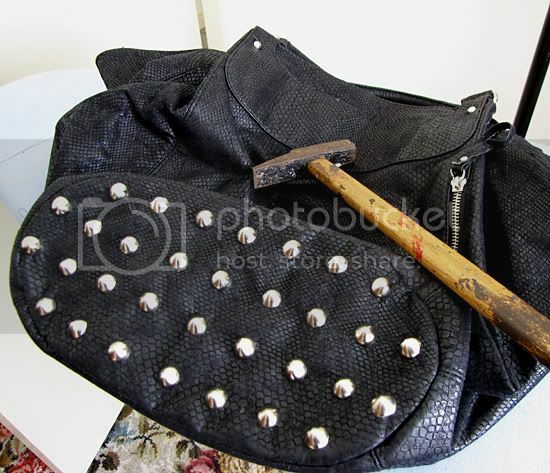 Begin studding the bottom by pushing the stud through the right side of the bag, turning the bag inside out and folding the prongs of the stud over with the pliers. 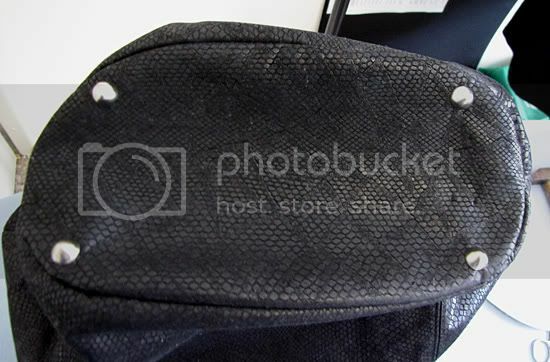 Place a stud in each corner of the bag first, as this will make it easier to align and distance the studs. 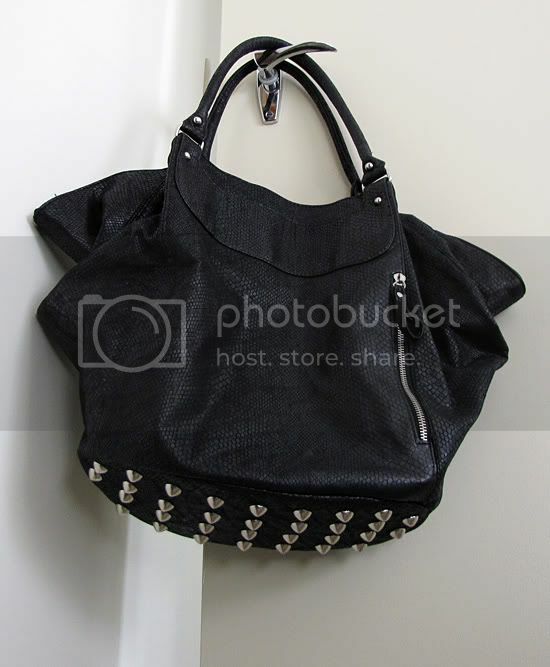 Finish the two shorter sides of the bag, then center one stud in the middle of each longer side. Fill in all the rows (may take a while!). 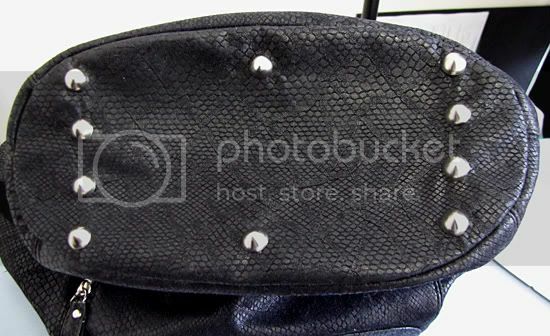 I added two more studs on each end of the base as the bottom of my bag is oblong-shaped. Turn the bag inside out again and re-insert the cardboard base. 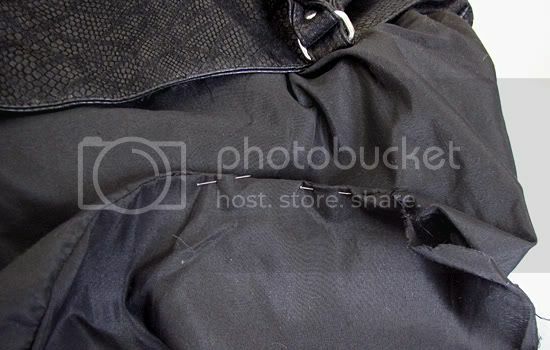 Use a needle and thread to sew up the layers you previously cut through. Turn the bag right way out and pull out the lining. 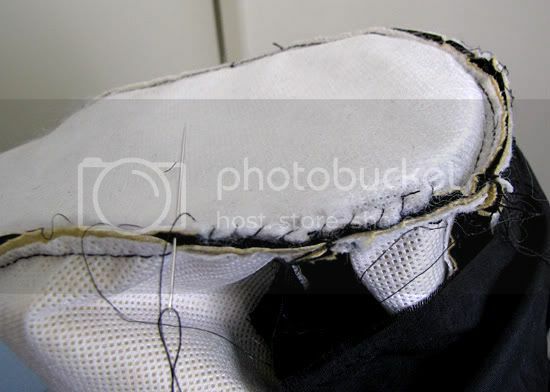 Fold the rough edges into the hole and pin the two sides together. 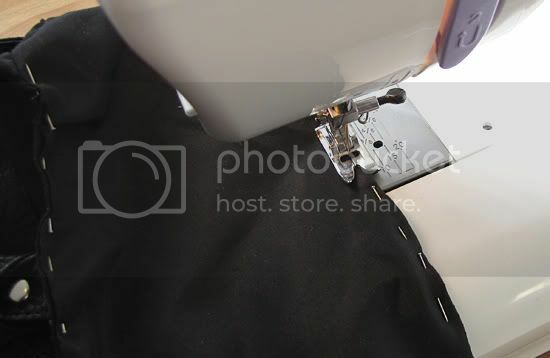 Use a sewing machine and matching thread to closely hem the edge of the lining. The finished lining should look quite neat. Push it back into the bag. And you're done! An Alexander Wang inspired bag is all yours! Wow, it looks so hot! So creative Sushi! I agree with Shen-Shen, it's hot! That looks great! Thanks for the tutorial! thanks for the tutorial...great one! oh, i love it! i wanna do one myself now! It looks fabulous :) Those studs are awesome, the only ones I can find in Adelaide are from Myer Centre Lincraft (and even those are square - based pyramid). I think I need to visit studsandspikes. I actually love this! Must make a funky sound when you put the bag down & all that. I think your blog is really lovely!! That's great. I was considering doing it, maybe with dog spikes... Now I need to find a bag! Wow, great idea! I love this blog!! Wow!! You did such a great job! this is a great DIY i'm definately gonna give it a go! oh my, that looks so brilliant. you are crazy talented lady. It looks fabulous!! Def. 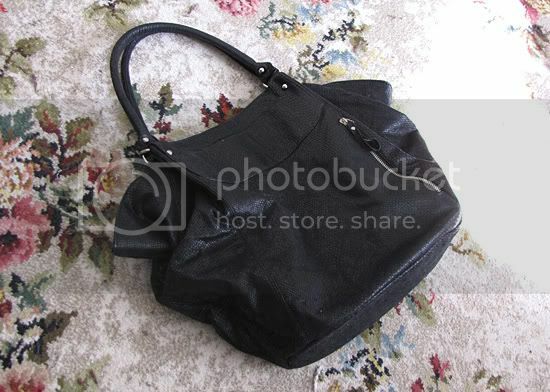 a more affordable alternative to the A. Wang bag. Wow! This is a cool idea... you are really good with the DIY! oh gosh this is amazing! Dope! Thanks for the tutorial! So gorge! A possible add on to your Etsy!? Thanks for the tut! Just a question, what size studs did you use? I love the idea!! Congrats!! Can I ask where you got the bag? This is fun! I just did this to a bag last week-and while I was image searching the A.Wang bag to show my friend my "inspiration" image- I came across your blog post! Great minds think alike! 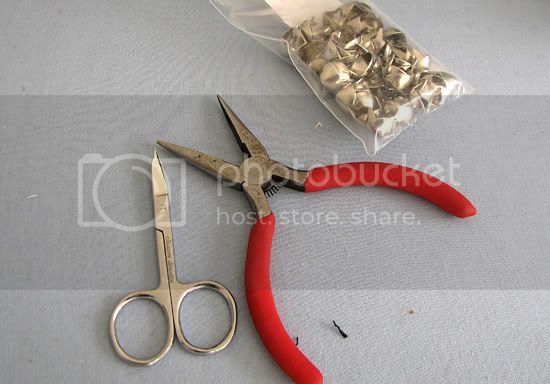 we love alexander wang's bag, so we think we'll do your same DIY work! !